Happy March 1st! It’s that time again! I have joined up with a great group of bloggers to give away $300 CASH for March Madness!! Good luck everyone!! Leave a comment below telling me what you would spend the money on if you won? 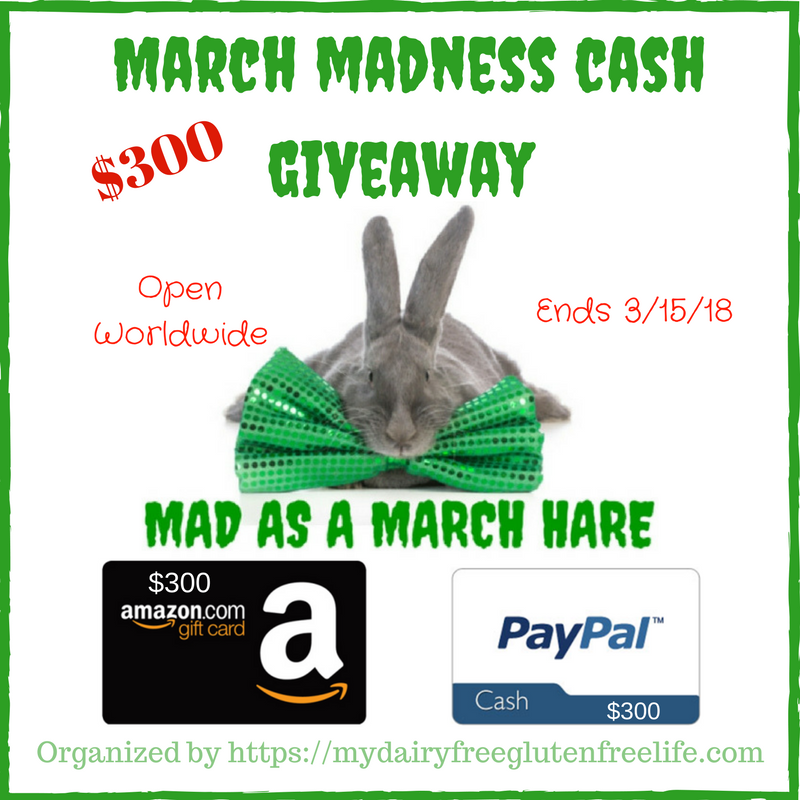 A group of fabulous bloggers (listed below) has come together to give one of our lucky readers a chance to win this $300 Cash March Madness Giveaway – Winner’s choice of an Amazon Gift Card or PayPal Cash! This is a blogger sponsored giveaway which means the bloggers listed below, have donated towards the cost of this giveaway! You will see these bloggers as entries on the Rafflecopter form. Bloggers: Pink Fortitude, Coupons and Freebies Mom, Moore or Less Cooking, Bacolod Lifestyle, This N’That with Olivia, Moms to Grandmas, Conserva Mom, Little House Big Alaska, MumbleBeeInc Deals and Steals, and Finger Click Saver. Open worldwide and ends March 15, 2018, at 11:59 PM EST. Disclaimer: This blog did not receive compensation for the published material in this post. No purchase required to enter this giveaway and there is a limit of one entrant per household. Void where prohibited. Odds of winning are determined by the number of valid entries received. Winner will be chosen by Random.org and will be emailed via the email address used to enter the contest. New winner(s) will be chosen if the original winner(s) has not responded within 48 hours of email notification. My Dairy Free Gluten Free Life is responsible for shipment of prize. This giveaway is not administered, sponsored, endorsed by, or associated with Facebook, Twitter, Google, Pinterest or other social media outlets. A disclaimer is posted in accordance with the Federal Trade Commission 10 CFR, Part 255 Guides Concerning the Use of Endorsements and Testimonials in Advertising. Filed Under: EASY, Give Away!, GIVEAWAY, March Madness $300 Cash Giveaway Tagged With: Cash Giveaway, Giveaway! !, March Madness $300 Giveaway! One of my favorite activities this time of year is watching the NCAA tournament and filling out a bracket which of course busts after the first game. Glad I started following your site. Makes it fun and easy to start cooking all over again. Easy recipes .to follow when you have a pictorial to go with it. Keep up the good work. But now I have to start a workout routine to keep from gaining too much weight. Lol. I like being in charge of the menu. Grew up in ACC country, gotta put out the spread. One of my favorite activities in March is getting out the Easter decorations and getting ready for Spring. It’s my favorite season! Love your receipes. Think my favorite is the Mississippi Pot Roast! Yummy! My favorite March Madness Activity? Reading and quilting. I admire people who can make tasty desserts. Continue with your passion. If I win it would really help with so many bills to pay. I love going for long walks in Marcj when the trees begin to bloom. I love preparing for the spring! Inevitably it would be something for my kitchen … or more ingredients. Sure would make my birthday brighter! What a great giveaway! Entered and I have my fingers crossed! For me, March is all about shifting gears from the cooler weather to the warm HEAT of summer, since we pretty much skip Spring here. I trade out our wardrobes, putting the jackets and jeans away while pulling out the shorts and flip flops. And I stop making soups and stews and focus more on dinners that don’t require the oven heating up the kitchen. I’m not really into sports, so that doesn’t interest me. My husband’s birthday is in March though, so I enjoy doing something special with him to celebrate! My favorite March activity is walking in the open air. I need a holiday badly and this would really kick-start a nice getaway. I like March Madness and Spring Cleaning !! Man! Wish I would have found this blog site sooner. I would have entered the tournament. I am winning my office pool right now.